Originally founded under the name Wicked Lester, formed in 1972 in New York City by Gene Simmons and Paul Stanley, KISS soon changed their name following the additions of Peter Criss and guitarist Ace Frehley to the band, and began performing across the New York club scene, signing their first record contract in November 1973. Their self-titled debut album, released in 1974, sold only 75,000 copies in spite of constant touring and numerous TV appearances. Despite the poor album sales, there was gaining support for the group's energetic live performances. To capitalise on this, KISS's fourth album, Alive!, was a live recording, and gained them enormous commercial success, culminating in over 500,000 sales, and quickly achieving Gold status. 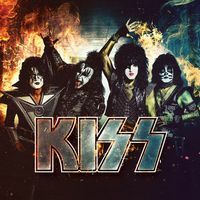 Their music incorporates many musical genres, an eclectic mixture of glam-rock, heavy metal and pop, but it is for their flamboyant costumes, face paint and exhilarating live shows that KISS are renowned, incorporating pyrotechnics, smoke bombs, fire breathing and blood-spitting. KISS are also one of the most commercially successful bands of all time, with heavy merchandising sales coming from brands such as clothing lines and models. This Compilation ℗ 2014 Simstan Music, Ltd. and Mercury Records, a Division of UMG Recordings, Inc.
℗ 2012 Simstan Music Ltd.
2009 Kiss Catalog, Ltd. Issued under license to Roadrunner Records from Kiss Catalog, Ltd. Roadrunner is a registered trademark of TheAll Blacks B.V.